NO RETURNS NO EXCHANGES Free Shipping within the 48 Contiguous States! Mystery Stocking Stuffer. This holiday season, the GMR elves have selected a fabulous assortment of Mystery Stuffers, offering both variety and value that your favorite gymnast and you will love. Buy for your family, gymnasts, team mates or a variety of gifts for a coach to share. Each Mystery Stuffer includes over 30 stocking stuffer gifts that have a retail value of over $175.00 and we will ship it for free. 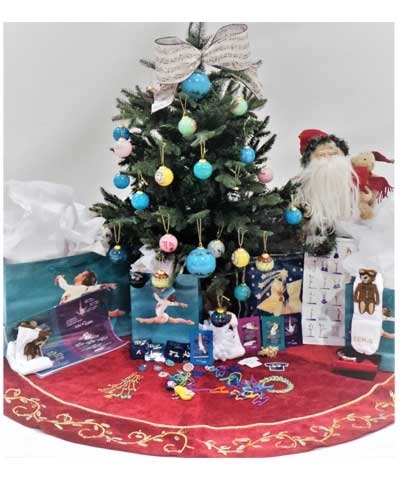 Includes a variety of Christmas ball charms, Cloggels, pins, magnets, bracelets, keychains, laptop skins, stickers, beamie socks, hair ornaments, Gymmy Bandz, gift bags and event earrings. NO RETURNS NO EXCHANGES. Free Shipping within the 48 Contiguous States!